Lumatek is the Leading brand of Electronic Ballast In the hydroponics and horticultural world, and Holland Forge is proud to be the exclusive distributor for Australia and New Zealand. Lumatek Electronic Ballasts are extremely power efficient, producing an intense light output while using relatively low power. With a light output of up to 30% more than conventional ballasts, it is no wonder why more and more people are turning to the Lumatek Digital Ballast range. Lumatek Digital ballasts use switching electronics and small frequency inductors to control the current and voltage to the lamp. They contain a ‘micro-processor’ similar to what’s used in a home computer. - compensate for degrading lamps by changing the output. 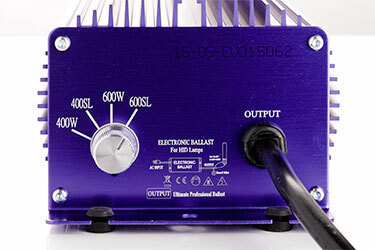 All Lumatek ballasts incorporate 'Soft Start' technology allowing them to use very low start up currents (amps). This is a huge advantage when using multiple ballasts, allowing more units to be turned on at the same time off the same circuit or timer.